Thank you for the messages, prayers, and grace-filled understanding shared with the MCC staff and Governing Board as we continue through a time of transition. As staff changes begin, we give thanks to Rev. Pressley Sutherland, Janine McCarthy, Barbara Crabtree, Rev. Elder Tony Freeman, and Rev. Dr. Lisa Heilig for their service as MCC Staff. I wish them many blessings as God directs their paths. In such a volatile, uncertain, and complex world, change can occur quickly through an election and slowly through shifts in time honored traditions. MCC is nearly 50 years old and we are not immune to the need for changes to continue as a movement and church into a new season. 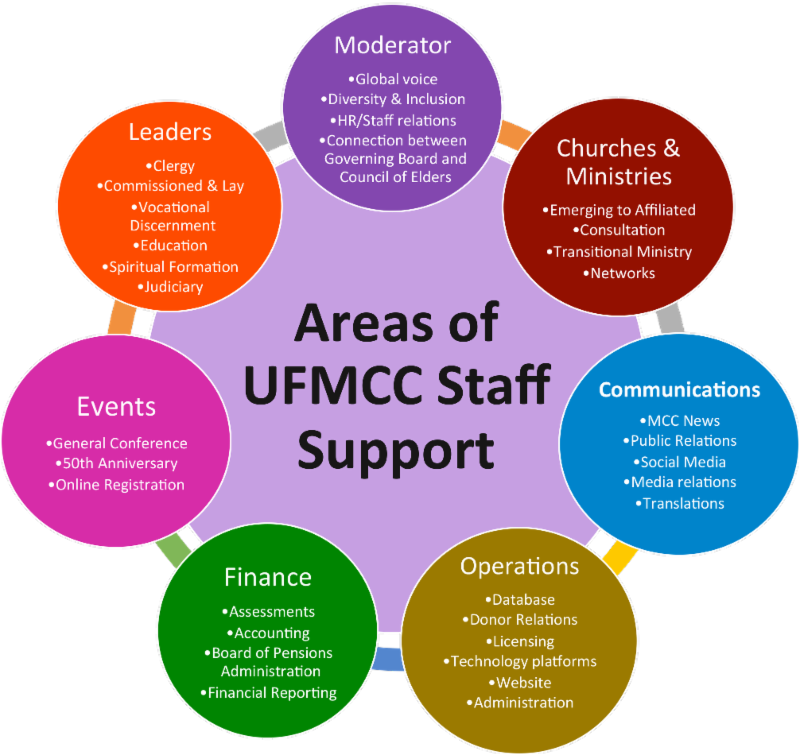 Changes in UFMCC Staff roles and responsibilities are nearly complete. I ask for your patience as we continue to define roles for staff, collaborate with volunteer teams including Network Leaders, and creatively adapt to the new staff alignment. Many staff members collaborated to form the shape and flow of roles and responsibilities. The team-based approach is grounded in the MCC Mission to transform ourselves as we transform the world. I am committed to lead the staff with openness and care, ensuring we remain spiritually anchored in the liberating Gospel of Jesus Christ. Even as people and roles change, we continue to develop and equip leaders, congregations and ministries which boldly confront current issues and foster spiritual growth. We continue to offer high-value training, local church support and resources, cutting edge theological exploration, and expanding partnerships. In this message you will find a circle graph with names of new departments. Each department is located within a circle around UFMCC. This diagram illustrates how our decisions and actions serve the people, churches, ministries, and leaders of MCC, which remains in the center. Each department is named, with programs and projects and staff people available for churches, ministries, and leaders. Many are wondering who to contact with questions. Included is a Church, Ministry, and Leader Guide which is a reference to assist in answering frequently asked questions. The guide is organized by topic, with a staff person’s name and email address. A Staff Email Directory is also included as an easy reference. It is my hope that, as we continue to work, worship, and pray together that our hearts will be transformed and we will be led by the Holy Spirit as we enter the 50 th year of MCC. This graphic chart (featured above) helps visualize the intersections that allow MCC staff to collaborative on projects and programs. This document provides details about departments, staff members roles, and ongoing programs. This document also provides a staff directory, in addition to a topic list of who to contact. If you have difficulty accessing these documents or have questions, contact Communications@MCCchurch.net .